Steeped in Maine island lore, this century-spanning double mystery pits a renegade fishing community against an unhappy child-bride of the 1820s, a defiant twenty-first-century teen, and a hard-drinking botanist—Dr. Gil Hodges—who escapes to the island of Matinicus to avoid a crazed ex-lover and verify a rumored 22 species of wild orchid only to find himself hounded by the ghost of a child some two hundred years dead. If Gil’s hoping for peace and quiet, he’s come to the wrong place. Generations of infighting among loose-knit lobstering clans have left them openly hostile to outsiders. When a beautiful, bed-hopping stranger sails into the harbor, old resentments re-ignite and people begin to die—their murders linked, through centuries of violence, to a diary whose secrets threaten to tear the island apart. Links to purchase this book: www.Darcyscott.net (author website, for personalized copies). Also available from Amazon, Smashwords, and Barnes and Noble. Darcy, how did you come up with the title for your book? Does it have any special meaning? Matinicus is set on the Maine island of the same name—a notorious, centuries-old lobstering community known for its wild west-meets-Beeper-generation lifestyle—and is based on its history and the unique mindset of what exists as essentially a closed society. My protagonist, the reluctant sleuth Gil Hodges, because he’s flawed in such a delightful way. He’s the kind of man women love and hate at the same time—drinks too much, is constantly drawn to women of a psychotic bent, yet he’s funny and self-effacing and knows his faults. Not really. As a mystery, it’s meant simply to entertain. That I’m both an entertaining storyteller with keen eye for plot, snappy dialogue, and colorful, convincing characters, while at the same time a writer of beautiful prose. 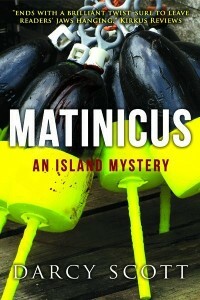 **Note: Matinicus is the first book in my “Island Mystery Series.” The second book, Reese’s Leap, will be released in spring, 2013.